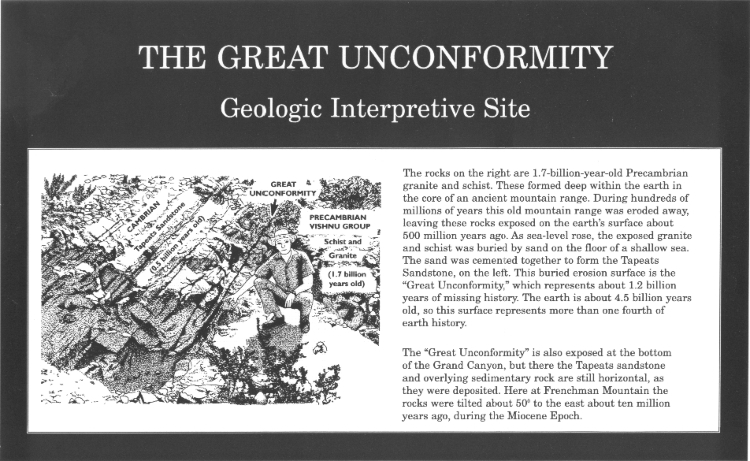 Who Gave the Great Unconformity its Name? 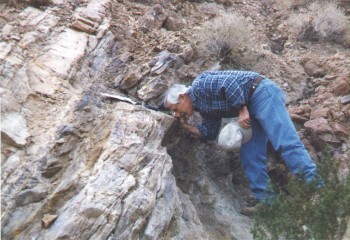 An unconformity is a buried erosion surface. It is a surface of rock that was exposed on the Earth's surface and was then covered by younger layers. 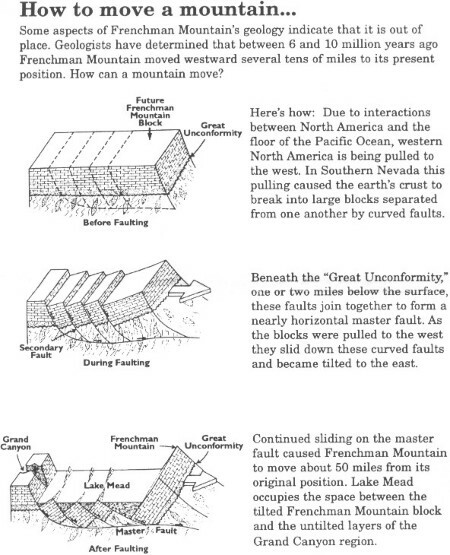 Unconformities are important because they represent missing intervals of the geologic record, like pages missing from a history book. The Great Unconformity represents about 1.2 billion years, which is more than one fourth of the age of the Earth. The Great Unconformity is best known from dramatic exposures in the Inner Gorge of the Grand Canyon. People are sometimes surprised to learn that at Frenchman Mountain they can visit the Great Unconformity without taking a long hike. Many people assume that the Great Unconformity was named by John Wesley Powell during his famous trip through the Grand Canyon in 1869. In fact, it was named by Clarence Dutton in his 1882 book Tertiary History of the Grand Cañon District. People also commonly assume that the Great Unconformity was so-named because of the enormous interval of time it represents. But when Dutton coined the term Great Unconformity he didn't yet know the age of the rocks on either side of the unconformity. In his 1882 book Dutton refers to the Tapeats Sandstone (now known to be Cambrian in age) as "lower Carboniferous quartzites." At some places in the Grand Canyon the rocks beneath the Great Unconformity are Proterozoic sedimentary rocks of the Chuar and Unkar Groups. 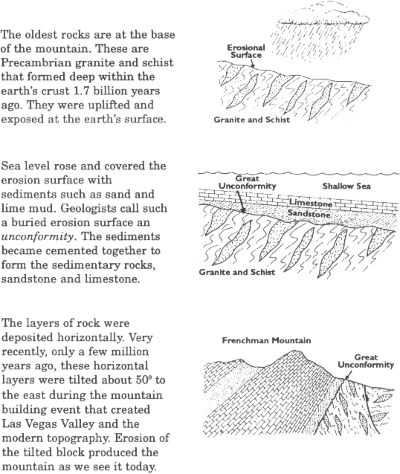 These ancient sedimentary rocks do not occur in Southern Nevada. 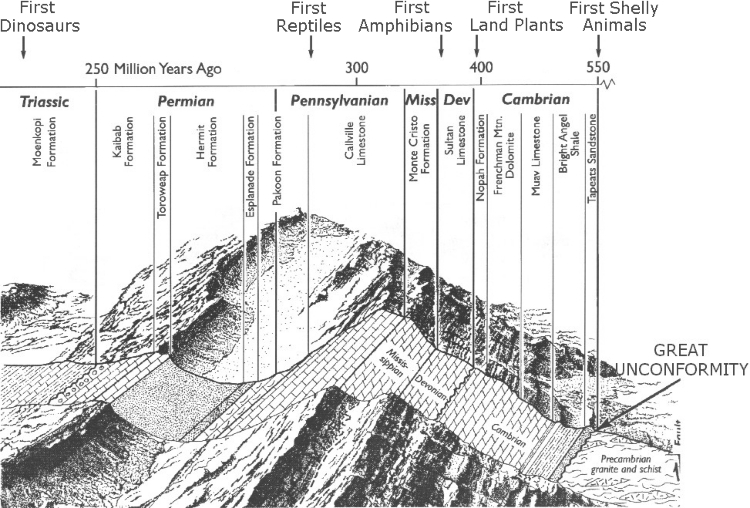 Dutton suggested that the sedimentary rocks beneath the Great Unconformity in the Grand Canyon are "probably Silurian," and possibly younger. It is clear from this that Dutton did not use the name Great Unconformity to imply a huge interval of time.